According to Britain’s largest lender, Halifax, house prices across the UK have jumped by an average of 4% in the year to September. Halifax stated that the average price of a house or flat in the UK had now risen to a new high of £225,109 and that the rise was fuelled by a shortage of properties for sale and growth in full-time employment. The view of rival lender Nationwide was that prices in the year to September rose by 2%. The difference is possibly attributable to the different way in which the data is gathered and also from where it is obtained. The 4% annual rise in house prices is calculated by comparing the three months to September with the same three months last year. The Halifax figures are not broken down by region; other research has indicated that while house price growth is slowing in the south of England, it is rising in parts of the Midlands and the North. 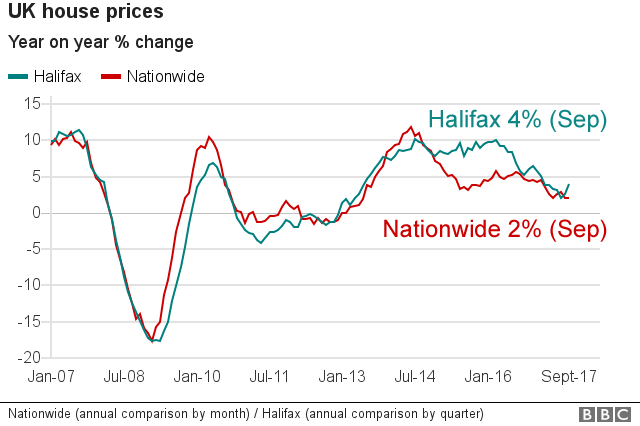 Between August and September, prices rose by 0.8%, the Halifax said, compared to a monthly rise of 1.5% in the previous month. Rising prices and squeezes on spending could stifle future demand, but it believed that the housing market was unlikely to be detrimentally affected by any interest rate rise by the Bank of England, according to Halifax. Managing director of Halifax Community Bank, Russell Galley, said: “While the quarterly and annual rates of house price growth have improved, they are lower than at the start of the year.